« WHERE IN THE HECK IS KALAMAZOO? 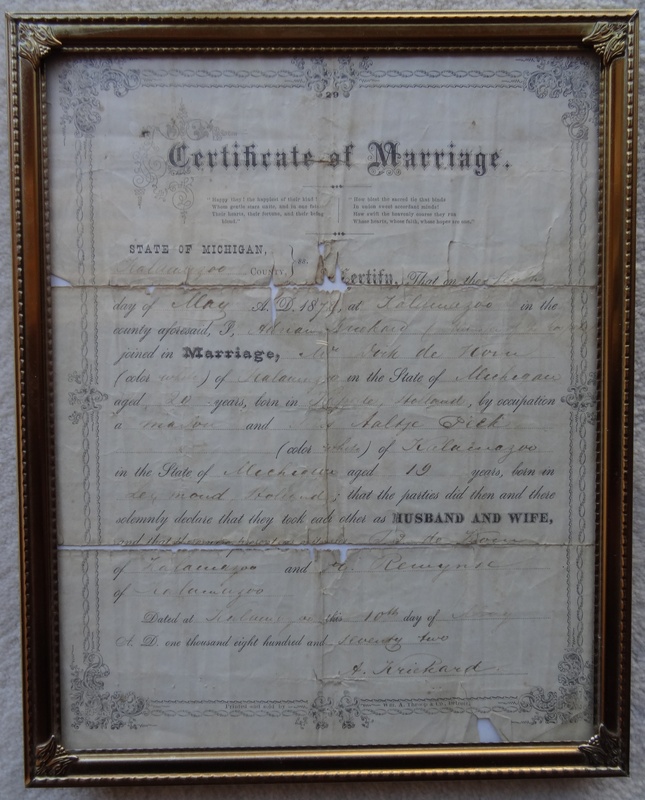 As I continue to sort through the boxes of photos and other memorabilia I have collected from my mother’s family, I see that I have the original Certificate of Marriage belonging to my great great grandparents. According to his marriage certificate, my great great grandfather, Richard DeKorn, was really named Dirk de Korn. 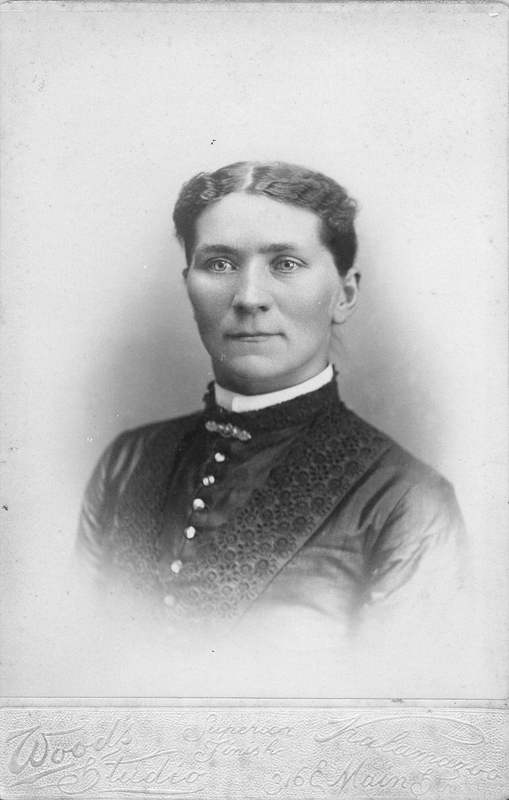 On May 10, 1872, at the age of 20, Richard married Alice Paak, 19, in Kalamazoo. Her name was actually Aleye Peek, if I believe this document. I thought Richard was born in Goes, but on his marriage document, where Richard’s birth date is given as 1852, not 1851, it states that he was born in Kapelle, not Goes. The 1872 marriage record of Dirk DeKorn and Aleye Peek was retrieved to check their places of birth and parents names. Dirk De Korn was listed as born in “Kasselle Netherlands” and Aleye Peek as born in “Leymond, Netherlands”. 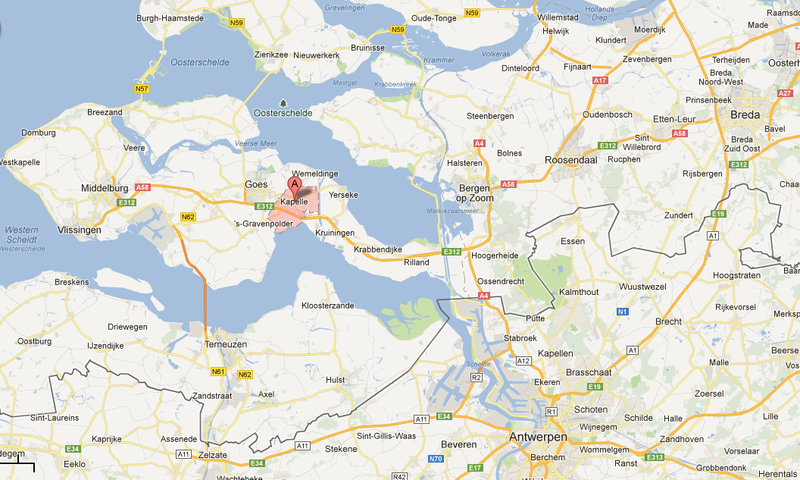 No such places exist but Kasselle suggests Kapelle (in Zeeland) and Leymond suggests Lexmond in Zuid-Holland. The parents of bride and groom were not listed. After reading this, I am not certain where I got the idea that Richard (Dirk) was born in Goes. Now I see that both his parents were born in Kapelle, as was he. So I looked up both towns on a map and found that they are very close to each other. This is such great history of and for your family; I know this gets you excited to look up more. It’s so true. I ought to call this blog “The Greedy Genealogist,” greedy for more the more I find! 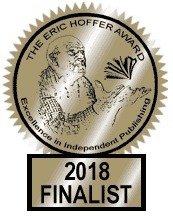 Thanks so much for reading and commenting! How about calling it “the master sleuth”? Hahaha, Yvette could call her website that! How wonderful to have the original document as well as a photo. I am going to enjoy following your blog. EmilyAnn, thank you so much for following and your kind words. And, yes, I am very blessed with these photos and other artifacts. Have fun with your blog–you’re doing a great job! I agree with EmilyAnn–It’s awesome that you have the original marriage certificate. Thanks, Sheryl! I’m really lucky with some of these goodies!